Today’s Interesting and amazing blogger is Kirti Choudhary from Flavors from my Kitchen. I got to know her from SNC group and she owns an awesome blog with lots of mouthwatering recipes. Some recipes are very interesting too.. I love to share some of my favorites in her blog which I have bookmarked to try in future.. Polo Rojo, interesting name right !!.. Trust me the recipe is also very interesting and innovative… This is my first bookmarked recipe from her blog… Another interesting recipe is coconut Ice… yummy sweet recipe. Biscuit Cake, Shakshuka Turkish style spicyegg, Grilled butterfly chicken……….. This is not all.. You will find lots of yummy baked goodies too. So don’t delay… just enter into her delicious foodie world and enjoy all yummy mouthwatering recipes. Kirti : Well I am Engineer by profession who love to spend her spare time in Kitchen !! Other then this I write, read (posses over 50 books ), travel (a lot),do DIY projects sometimes..
My blog is very casual one and it’s the result of demands of my friends..it’s really awesome feeling when they try their hands on my dishes and call ..
For good recipe, I can go to any extent! You wouldn’t believe, how many people I spoken to ( from road side venders to chefs to Relatives) to ask for the recipe or their special touch.. So ,I would say all people around me are my support system..
Kirti : No one specific as I watch a countless number of TV shows ( TLC,NDTV,FOX Traveller etc etc) as well as surf to dig into the every aspect and details of cuisine or ingredients for better understanding…This is how I get my inspiration for new recipes….I would love to serve any of them some Authentic Chicken Dish & some Indian dessert ! Priya : What comes to your mind when you hear the word “savoury“? Kirti : As I am typical north Indian, Savory mean all streat foods like Gol-gappe,Chats,Samose,Pakode,Vada-paav etc ! Priya : Name any three ingredients which you will never miss in most of your recipes? Kirti : This one is tough one…well it must be salt,sugar,freshness. Priya : What are your family member most favorite recipes of yours… Mention the link if you have posted in your blog? Kirti : It changes person to person..but recipe which is always hit at my gatherings table is Stuffed Whole Chicken and fudge Chocolate Cake with Vanilla ice-cream. · Remove stems of green chilies before storing it in fridge for long lasting freshness. · To clean burned utensils, boil water with some baking soda in it. Kirti : Your blog’s simple detailing makes it stand out and that's why I like it too like many others..Sorry m very new in blogging world to give any tips to you. · Preheat the oven o 180’C. 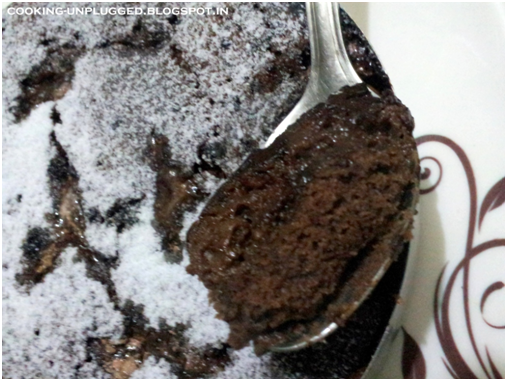 · Sieve Flour, baking powder and cocoa powder in a bowl. · Pour the batter in baking dish. Sprinkle granule sugar, chocolate chunks. · Boil the water with coffee powder and pour it over the batter in baking dish. · Bake it preheated oven for 10-12 minutes, until the top become firm and looses the edges. · Sprinkle some icing sugar and Serve hot with vanilla ice-cream (optional). Don’t Serve it cold..I would recommend making it at the time of serving only. It’s really very nice to know more about you dear… Thank you very much for participating and your guest post recipe is really very yummy n delicious. And Friends....Hope you all enjoyed today’s interesting chat with a yummy dessert.. Thank you so much everyone for your continuous support.. Stayed tuned for next week!! Will meet you all with another interesting blogger…. thanks for opportunity dear :) !! glad u liked my dessert ! Even i came to know her through SNC, Kirti an engineer,omg, gal u rock..Love and enjoy reading..That fudge cake is a killer. glad to know about kirti.. nice post..